9/9/1999, that was the day a "bunch of passionate gamers and friends" from California got together and founded Func, a company whose goal is "to create computer gear designed for gamers, by gamers." That's a story and indeed a promise we've heard on a fair few occasions in this industry, yet somehow Func's products do seem more genuine than most. There's rarely a marketing blitz surrounding new launches, fancy gimmicks aren't usually present, and the company instead claims "it’s about enhancing your gaming experience in a more meaningful way." Well, with manufacturers the world over itching to make a move into the burgeoning gaming peripheral market, there's never been a better time for Func to step up to the plate. Having specialised in mouse pads for over a decade, the firm is now hoping to evolve its catalogue with the well-received MS-3 mouse, the upcoming HS-260 headset, and the newly-released KB-460 gaming keyboard that's on the test bench today. Arriving at UK stores with an introductory price tag of £65, the KB-460 is a statement of Func's intent. 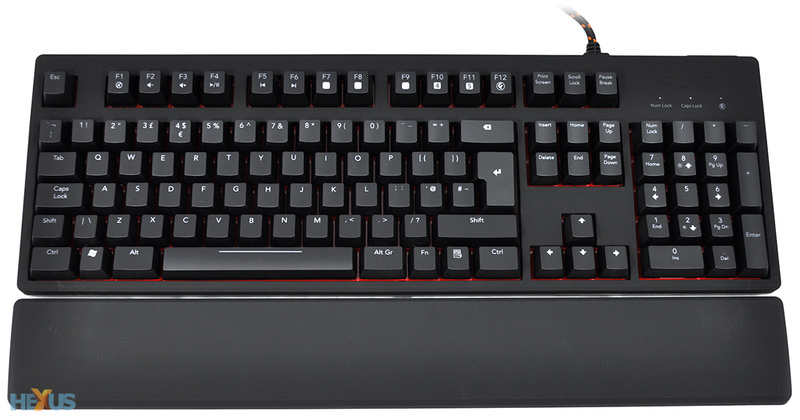 Rather than tiptoeing into the market with a membrane solution, the company is diving head first with a fully mechanical board that offers gamer-favourite Cherry MX Red switches and full backlighting. Does the layout look a wee bit familiar? We thought so too, and though we've yet to fully dismantle the keyboard, we've come to the conclusion that Func is most probably using the underlying design of Tesoro's Durandal G1NL, which also serves as the core of the Qpad MK-85. Knowing that the inner workings have been seen elsewhere would normally take the gloss off a new product launch, but that isn't the case here as Func's pricing is particularly keen. As it stands, the £65 launch promotion makes the KB-460 a serious competitor to the £100 Qpad MK-85. Making things even more interesting, UK retailer Ebuyer is currently bundling the KB-460 with the MS-3 mouse for a rather-tempting £99.99. Perusing Func's specification sheet makes it clear that the KB-460 is aimed squarely at gamers. We suspect other key-switch flavours may be in the pipeline, but right now, the keyboard is available only with linear Cherry MX Red switches that have a low 45g actuation force and are deemed ideal for gaming. As you'd expect from a mechanical keyboard, anti-ghosting and full n-key rollover are present and accounted for, and Func has gone that extra yard by including backlight key illumination. A red LED is housed above each key switch and there are three levels of brightness, as well as a pulsating mode. The backlight is plenty bright, and Func has amplified the effect by using a red keyboard tray. You can just about make it out between the keys, but with the backlight enabled, you get a cool and unmissable red glow. However, and as with all mechanical keyboards thus far, the LED illumination is uneven and aimed at the upper half of the keys. To make the most of this configuration, Func has the majority of its lettering near the top of the keys - it's not ideal and isn't the best use of keycap space, but it's an acceptable workaround until a better solution presents itself. Overall build quality is good, and though there is a slight amount of flex in the plastic chassis, you don't notice it during use. Key layout, meanwhile, is logical throughout - though modders should note that the bottom row has a fair few non-custom key sizes - and localised versions are available for US, French, German, Nordic, Russian and UK regions. 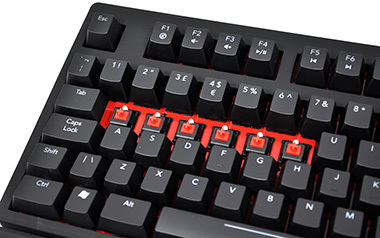 Opting not to use superfluous keys, the KB-460 has multimedia shortcuts spread across F1-F6, while the backlight level is controlled by Numpad 2 and 8. We do miss the volume scroller from our last gaming keyboard, but the minimalist design has enabled Func to create a streamlined and sleek aesthetic that's in keeping with its existing products. The upper half of the plastic chassis is coated in a soft, black, almost rubber-like coating that looks elegant and feels luxurious to the touch. The surface seems surprisingly resistant to scuffs or scratches, although fingerprints are a problem. Ours is relatively new yet we've already felt the need to wipe it down on a couple of occasions.